Even though Nebraska is landlocked, and the nearest ocean is a two-day's drive, good sushi, made from fresh fish, is popular restaurant fare. Kinja, in the 70th Street and Pioneers Boulevard complex, is the latest to offer a wide variety of Japanese items, including sushi, teriyaki, udong (noodle soup) and special rice rolls. Owner Kim Hyang is no stranger to running a restaurant. Shogun, another popular Japanese eatery, also is under her direction. 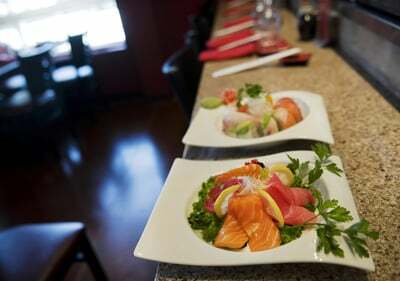 Kinja, which has been open for about two months, focuses on handmade sushi, sashimi and specialty rolls. In keeping with other dining spots in this area, the decor is upscale and contemporary. In addition to general table seating, there is a sushi bar with seating, too, where you can watch your meal being prepared. Although I still am learning the ins and outs of ordering this type of fare, part of the fun is experimenting with the menu. We started the meal with edamame, which was salty and fresh tasting, and calamari tempura, a lightly fried squid. The sauce, with sesame seeds, was sweet and tangy. My husband and I look for different things in a sushi restaurant. He prefers the raw fish in sushi (fish served over rice) and sashimi (thin slices of raw fish with no rice), while I like the blend of ingredients inside the rice rolls, some raw, some cooked. He ordered the Kinja Sushi A, a combination plate which includes a California roll and the chef's choice of seven pieces of sushi for $16.99. That evening, the selection included shrimp, yellowtail, salmon and two types of tuna. The fish was fresh tasting and elegantly displayed. The specialty rolls have creative names, and I selected "Miami Vice," a tempura roll with smoked salmon, cream cheese, avocado and topped with asparagus and eel sauce for $11.99. It was very tasty, and the asparagus, with a light tempura batter, was a great surprise. The most popular roll is the "Play Girl," which includes shrimp tempura, crab and smoked salmon with a crunchy top and mango sauce. Our dinner, with two appetizers, and one glass of wine, came to about $50. Individual orders over $10 come with miso soup and a salad. The well-trained wait staff was helpful in clarifying menu selections. The restaurant, which does not take reservations, was busy on a Friday night, and we snagged the last table. Lunch entrees are similar to the dinner offerings, but cost 10 percent less. Another option is the Bento box, a Japanese-style lunch with a variety of items for $8.99. 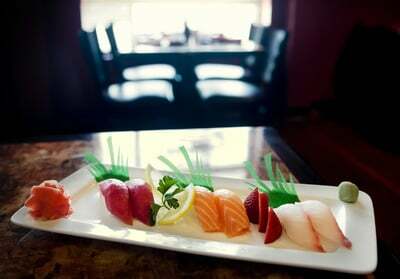 One word of caution to newbie sushi diners: Part of the fun is sharing dishes and trying as many items as possible. But it is easy to get carried away, so keep track of your order, as the cost adds up quickly. This new Japanese sushi restaurant is a welcome addition to the dining scene and is more upscale than other local restaurants that offer this fare. Reach Kathryn Cates Moore at 402-473-7214 or kmoore@journalstar.com.